A variety of Curtis’ trophies call these mailboxes their home. Curtis High School has won many championships in basketball, football, bowling, lacrosse, etc. But these trophies are never on display in the hallways or lobby; instead they sit on top of the teachers’ mailboxes in the main office. There are 22 trophies above the mailboxes. These include the Curtis High School Varsity Basketball 2010-2011 Scholar Athlete Award, Public Schools Athletic League Girls Division “A” Basketball Champion 2007-2008, 2011-2012, PSAL Boys Tennis Bowl Team Championship 2012-2013. 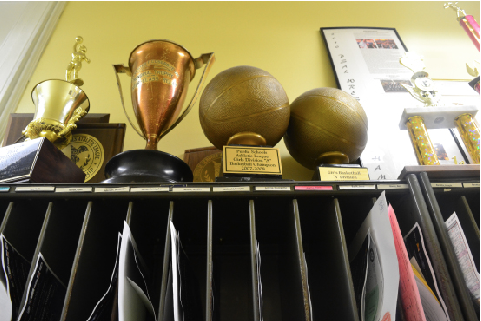 Athletic coaches Ms. Sutton and Mr. Banks both say there is nowhere for the trophies to go and that is why they’re on top of the mailboxes. “The hallways are too crowded to have them displayed in the hallways,” said Banks. “After the new gymnasium is built there will be cases to display all of the trophies,” said Eric Ritzer, assistant principal of physical education and athletic director. Ritzer is aware of the problem and plans on doing something about it. Although the trophies may stay about the mailboxes for a few more years, there is now a solution in the works for this problem. Students like Jenna Muldoon feel that the trophies should be showcased because it would show our school pride. There are, however, near empty trophy cases flanking the swimming pool. There are trophies from 1990 and 1970. These cases could definitely fit in more awards.